Steven A. Reich. Lanham, MD: Rowman & Littlefield Publishers, 2013. In 1982, William H. Harris published The Harder We Run, a concise narrative of black workers since the end of slavery that has been used in scores of undergraduate labor and African-American history courses. Steven Reich’s A Working People is a worthy successor to Harris’s outdated work. 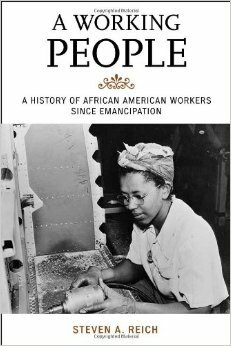 It is a didactic, accessible overview of African-American workers since emancipation that provides a solid base for general readers and suggestive research possibilities for those wishing to probe more deeply. A strong bibliographic essay and thirty-six pages of primary source documents bolster research efforts. Reich, an associate professor of history at James Madison University, is known for his work on the Great Migration, the six million-person exodus from the South to the North undertaken by African Americans from 1910 to 1970. Although Reich pays attention to Southern workers, four of the book’s six chapters deal more extensively with Northern workers. Reich’s justification for this is familiar to scholars of black labor history: the lost promises of Reconstruction. Social and political decisions to forgo land redistribution, continued military occupation of the South, or a thorough political reorganization of the region produced what historian Eric Foner dubbed an “unfinished revolution.” As Reich shows, Southern African- American workers–including longshoremen, laundresses, timber workers, and miners–struggled heroically at times, but terror, political disenfranchisement, and poverty were the salient features for postwar Southern black workers. Dreams of a more open society and the lure of industrial labor lured legions of African Americans to the North, where they found work easier to obtain than justice. The North was no Promised Land of tolerance and black families found themselves segregated by custom rather than by law. They were generally denied desirable jobs in favor of hard, dirty, dangerous and undercompensated work. Even those jobs, however, were better than could be obtained in the South. Whenever job markets were glutted, as they were during the 1920s and during both world wars, African Americans trekked northward. In many respect, the modern civil rights movement was stimulated as much by northern as southern racism. Reich documents the deplorable record of organized labor in advancing anything that resembled biracial solidarity. Reich is somewhat myopic in that he too closely identifies the pre-New Deal labor movement with the American Federation of Labor (AFL), most of whose affiliates excluded black workers altogether. He spends time discussing the Brotherhood of Sleeping Car Porters (BSCP), a truly remarkable organization, but Reich could show the roots of biracial organizing by looking outside the AFL. The BSCP, for example, peaked at 15,000 members; the Knights of Labor–which is not discussed–organized 90,000 black workers in the 1880s. In like fashion, the radical Industrial Workers of the World organized tens of thousands of black workers, as did the Communist Party. When he hits the 1930s, Reich corrects his inattention to militant organizing when looking at the Congress of Industrial Organizations (CIO) and the efforts of packinghouse workers, miners, steelworkers, and autoworkers. The United Automobile Workers, in fact, often cooperated with A. Philip Randolph to form the voice of conscience within the merged AFL-CIO after 1955; it also threw financial and logitical support behind the civil rights movement. It was not enough. Reich gives a succinct overview of Herbert Hill’s bitter critique of entrenched racism within the AFL-CIO and, by the late 1960s, even the UAW found itself the target of black-led revolutionary union movements. Only then did organized labor begin making the institutional adjustments necessary to align racial policies with outward claims of being progressive organizations. Reich’s story of black labor thus far does not have a happy ending. Recessions, deindustrialization, and the coming of a globalized post-industrial economy sandbagged the transformation of unions and workplaces (the latter compelled by decades of civil rights and affirmative legislation). Reich offers Gary, Indiana, as a vivid example of a city that went from a beacon of racial promise to a Rust Belt nightmare within a single generation. Moreover, as economic security grew more precarious for all Americans, many one-time allies became rivals. Reich ends his book by reflecting upon what changed and what did not between now and 1968, when the Rev. Martin Luther King, Jr. came to Memphis in support of striking sanitation workers. He praises the overall “opening” (141) of American workplaces but remains cognizant of the “the persistence of high rates of unemployment… the proliferation of bad jobs, and seemingly entrenched income inequality…. (166). An unfinished revolution indeed.